Juan joined the financial services industry in 2006, and provides our clients with more than a decade of experience and industry expertise. Juan takes a holistic approach to address clients’ financial needs, with a special concentration on asset management and preservation, and wealth transfer. He works closely with each client he serves to educate them on their options and to implement a tailored financial strategy designed to achieve their goals. 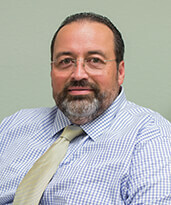 Before joining our team, Juan was a financial advisor with Edward Jones. He earned a bachelor’s degree in international finance and management and postgraduate course work in accounting from the University of Miami. Juan also holds the designation of Accredited Asset Management SpecialistSM. This required him to complete a course of study encompassing investments, insurance, tax, retirement and estate planning issues. The designation also requires Juan to adhere to standards of professional conduct and participate in continuing industry education. Juan is a member of the University of Miami Hurricane Club and is a member of the Coral Reef High’s Barracuda Band Parent Association (BBPA). In his spare time, he coaches soccer and enjoys reading. Originally from Santiago, Chile, Juan is fluent in Spanish, and also has a working knowledge of Italian. He lives in Miami with his wife, Jony, and their daughters, Caterina and Stefania.